We propose to use adaptive wavelet lifting for image retrieval systems that are based on shape detection and multiresolution structures of objects in a database against a background of texture. To measure the performance of our approach, feature vectors are computed based on moment invariants of detail coefficients produced by the adaptive lifting scheme and retrieval rates are obtained by measuring distances between these vectors. Retrieval rates are compared with the rates obtained when using non-adaptive wavelet filtering as a preprocessing step. A synthetic database is created for this simulation. Oonincx, P.J, & de Zeeuw, P.M. (2003). 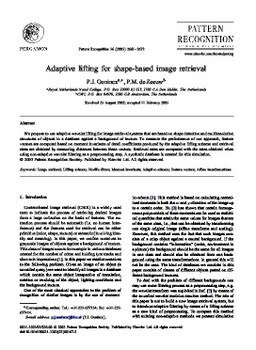 Adaptive lifting for shape-based image retrieval . Pattern Recognition, 36, 2663–2672.